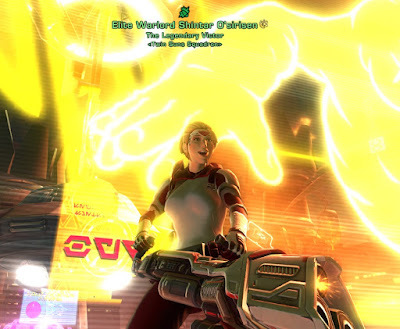 ... but I can finally call myself Elite Warlord Shintar O'sirisen! For those who don't know, Elite Warlord is the title you gain for reaching (the final) Valor rank 100. Valor doesn't really do anything other than fill up a bar to show how much PvP you've done and has a reputation for getting ridiculously grindy towards the end, but precisely because of that reaching the top rank is still somewhat of a badge of honour. I've heard people say that 90-100 takes as long as 1-90 combined, and while I don't know if that's true, the last ten levels certainly did feel very slow. Also, it has been nearly three years since I posted about hitting rank 90. I wish I could tell you just how many matches it took me to get there, but unfortunately the in-game stats seem dodgy to say the least. If I truly only ever won 408 matches, that would mean that at a win rate of roughly 1 in 3 (which I can back up with science! 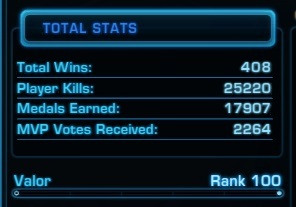 sort of) I played a total of 1,224 games. But if you then apply that number to the other stats, I would have received nearly 2 MVP votes per match and earned over 14 medals each time. That seems like quite a stretch. Whoa! Wow Shintar, congratulations! I'm very far off, even though I love PvP. I just play too many alts.